Former “Top Chef” contestant and San Francisco Chef Ryan Scott shares some of his Fourth of July Favorites featuring Anchor brews. I love beer. It’s just a fact that everyone that knows me is aware of. When I was getting my beer and wine license for my restaurant, Market & Rye, in Potrero Hill, the first beer that came to my mind was Anchor Steam®. Anchor Brewing is located close by and I know that all of my friends are Anchor beer drinkers. I have some of my best memories from last Fourth of July sitting on my patio in the Sunset area with my amazing girlfriend and our friends and family enjoying some ribs and cold Anchor Steam® Beers – Everyone telling stories that made us all laugh and knowing what a great holiday get-together can really be. The cooler and the fridge are always stocked with San Francisco products, and when it comes to great SF beer, I always choose Anchor. 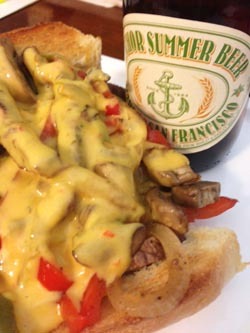 Who doesn’t love a Philly Cheesesteak and an ice cold Anchor Summer® Beer? Especially when that beer and tequila, with some added flavors, is mixed with a jar of old school Cheez Whiz! Yup! I said Cheez Whiz! 1. Season the loin slices with salt and pepper. 2. Brush grill with oil and grill meat until desired temperature to serve. 3. Place meat in the sandwich roll, top with veggies and Beer-Cheez sauce. 1. Char peppers on the grill, remove skins. 2. Place all ingredients, except the cheez whiz, in a blender and puree together. 3. Place puree mixture in a pot and bring to a boil on high heat. Once boiling, reduce to medium heat for 20-30 minutes. 4. Fold in “Cheez Whiz” and reduce heat to low. Cooked and paired with Anchor California Lager®. 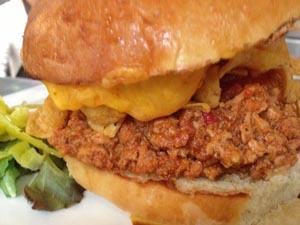 Its smooth taste balances the spicy chicken mixture in the sandwich. 1. In a large pot, melt butter, and then add oil. Once heated, add onions and leeks and cook until translucent in color. 2. Add chicken and brown off. 3. Deglaze with beer, cook until liquid is almost gone. 4. While chicken is browning, combine the remaining ingredients in a bowl and mix together. 5. Once the beer has reduced, add the bowl of ingredients and bring to a boil. Reduce heat and simmer for 3 hours. 6. Strain the meat mixture, reserving the liquid. Place the liquid in a pot and bring to medium heat, and then reintroduce the meat mixture. Cook for additional 20 minutes. 7. Serve warm on a hamburger bun with mozzarella cheese and corn chips. Culinary Tip – The meat mixture freezes well for future use. Brekle’s Brown Pork Ribs with Ryan Scott’s BeerBQ Sauce. 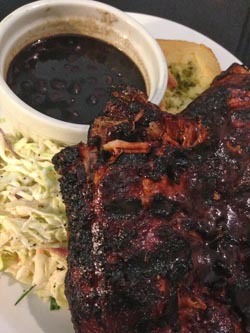 This recipe uses Anchor Brekle’s Brown in both the ribs and the sauce and pairs nicely with an ice cold bottle of the brew. 1. Place ribs in a stockpot large enough to have them completely submerged in the beer. 2. Add liquid smoke, onion, garlic, bay leaves, chili flakes and bring to a boil. 3. Reduce the heat and simmer the ribs until tender, about 45 mins. 4. Remove the ribs from the liquid and place in a baking dish and baste with BeerBQ sauce. 2. Bring to a boil and then reduce heat to medium. Ryan Scott, 31, zeroed in on his desire to be a chef at the early age of nine when the “toys” at the top of his Christmas list included kitchen utensils, a wok and food dehydrator. Growing up in Modesto, California, he developed a passion for the culinary arts and, at the same time, shaped his well-honed competitive side as a star player on the Los Banos High School varsity basketball team. Seeking to be the best at any early age, he entered the prestigious California Culinary Academy (CCA) in San Francisco in 1999. Ryan’s professional career began with a one-year internship at the acclaimed Bistro Roxy in Reno, Nevada. In 2001 the enchantment of Hawaii and its array of opportunity compelled him to move out of the landlocked Central Valley to the island of Maui, where he leaped head-first into Polynesian cuisine and took full advantage of his surroundings, eventually staged under two of Hawaii’s finest chefs, Peter Merriman and Alan Wong. A 2001 graduate of the California Culinary Academy, Scott has cooked and learned in the kitchens of many of the country’s best chefs. He was a line cook at Restaurant Gary Danko, and staged with Daniel Boulud at Daniel in New York, Charlie Trotter at Trotter’s in Chicago, and Suzanne Goin at Luques and A.O.C. in Los Angeles. In late 2005, he joined the Myth restaurant group and launched its successor, Myth Café two months later. Myth Café became an ultimate hot spot for foodies and the lunch crowd in San Francisco and was named one of the top dining destinations for California cuisine by San Francisco Magazine, within the its first three months of opening. 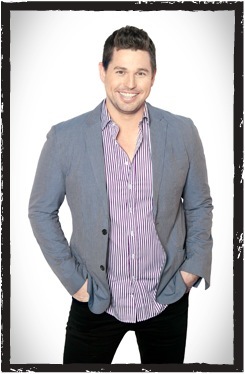 In late 2007 Scott was cast as one of 16 contestants on Bravo television’s national, top-rated reality cooking show, “Top Chef.” Shot in Chicago and judged by some of the country’s most famous chefs, the show was an exhilarating, highly educational and singular experience for Scott and his fellow contestants. Ryan joined Mission Beach Café in June 2008. During his stint at Mission Beach Café, it was recognized as a top brunch destination by 7×7 Magazine. In addition, his efforts at Mission Beach Café were noticed by USA Today and Zagat. Ryan works extensively with many community organizations, donating time and cuisine, such as Meals On Wheels of San Francisco, Inc., and Make-A-Wish Foundation. The American Heart Association, the Guardsman Association and Ryan Scott’s Annual Harvest of the Heart are just a few other notable contributions. For more information on Ryan Scott, visit www.CookingWithRyanScott.com.